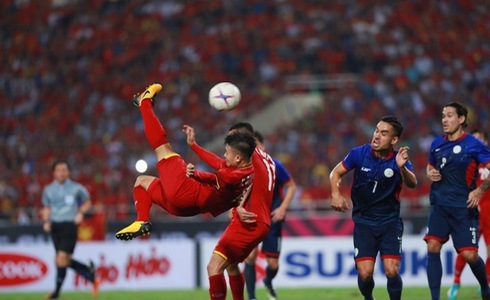 Vietnam knocked out the Philippine 4-2 on aggregate to advance to the 2018 AFF Championship’s final following a 2-1 victory in their second-leg semifinal in Hanoi on Thursday. The home side entered the game with a 2-1 advantage on aggregate after the first-leg semifinal in Bacolod, Philippines last Sunday, but had a difficult time keeping that momentum during the first 45 minutes of Thursday night’s game. The Philippines pressing defense made for a slow first half until the 33rd minute when Van Hau flew down the left wing and centered the ball to Striker Anh Duc for a failed on-target attempt at netting the ball. Both teams finished the half goalless. The Philippines started the second half strong, knowing they needed at least two goals to advance to the tournament’s final round, but Vietnam still managed to take the lead in the 82nd minute when Quang Hai finished a cross assisted by Van Duc. Just four minutes later, Vietnamese striker Cong Phuong scored a second goal to make it 2-0 for the home side. The Filipino side finally put themselves on the board in the 88th minute when Younghusband converted corner kick. When the match ended with Vietnam head 2-1 the crowd at My Dinh National Stadium exploded in cheers and chants. The Golden Stars advanced 4-2 on aggregate to the final, where they will be challenged by Malaysia. The Malaysians secured their final ticket after holding Thailand 2-2 in their return game in Bangkok on Wednesday, following a goalless draw in the first-leg semifinal. Football fans across Vietnam are celebrating their first final berth at the AFF Championship, contested by 11 nations in Southeast Asia, in ten years. The Golden Stars won the title in 2008 after beating Thailand 3-2 on aggregate. They are now only two games away from the second title in the country’s football history.